Copyright © Tony Peterson - This image is copyrighted. Unauthorized reproduction prohibited. Polished surface. The precise locality is a tributary of the Oloibortoto River, which is sourced in the Nguruman Escarpment and drains into Lake Magadi from the west. These Tertiary olivine nephelinite flows are rich in carbonate-zeolite segregations interpreted as late carbonatite melt (Saggerson and Williams 1964, J Pet v. 5). 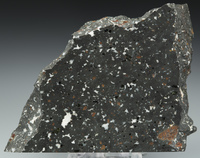 Red is altered olivine, black is augite.